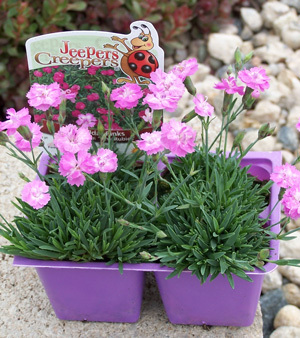 Cousins to the carnation, Cheddar Pinks have been grown in gardens for centuries. 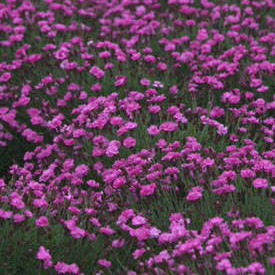 This compact selection is especially popular as an edging plant, or in the rock garden. It forms a low cushion of olive-green leaves, bearing masses of small, fragrant double rose-pink flowers in late spring. Drought tolerant once established. Clip lightly after blooming. Not always easy to divide, but this can be attempted in early spring or fall. Flowers may be attractive to butterflies. Evergreen.